Unilateral prostate cancer is a type of focal therapy for localized prostate cancer where only half of the prostate is treated or removed. Advanced diagnostic methods have recently allowed physicians to be able to locate the exact position of a tumor within the prostate. By only treating the area where the tumor is located, a doctor can reduce the risk of complications and side effects that may result from prostate cancer treatment. A study published in November 2016 by the Journal of Endourology and highlighted last month by UsTOO, a prostate cancer support and advocacy group, compared using HIFU hemiablation and robot- assisted laparoscopic prostatectomy (RALP) in the management of unilateral PCa. Comparing High-Intensity Focal Ultrasound Hemiablation to Robotic Radical Prostatectomy in the Management of Unilateral Prostate Cancer: A Matched-Pair Analysis. Albisinni S1, Aoun F1, Bellucci S1, Biaou I1, Limani K1, Hawaux E1, Peltier A1, van Velthoven R1. Although still experimental, focal treatment is being increasingly implemented in the management of prostate cancer (PCa). 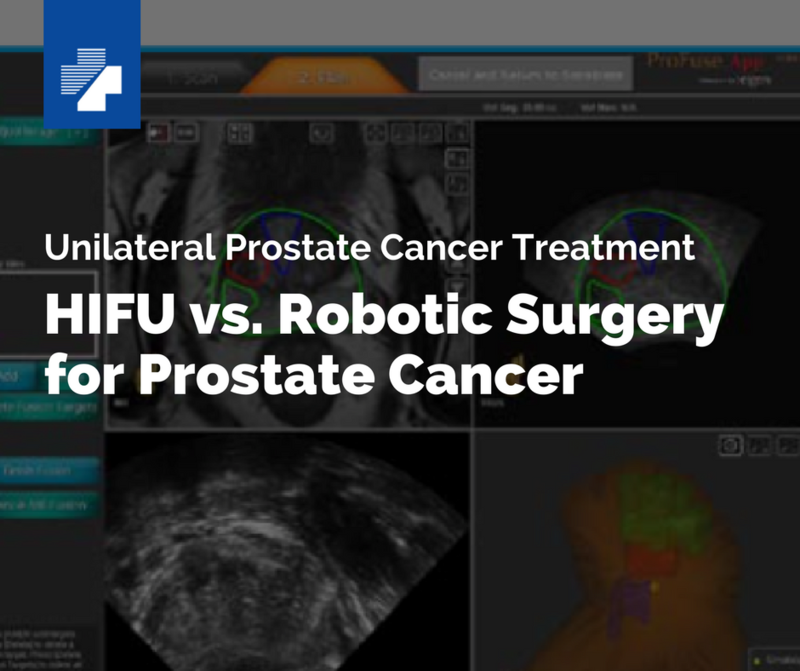 Aim of the current study was to compare functional and oncologic outcomes of high-intensity focal ultrasound (HIFU) hemiablation of the prostate to robot-assisted laparoscopic prostatectomy (RALP) in the management of unilateral PCa. Fifty-five men with unilateral, clinically localized PCa underwent HIFU hemiablation of the affected prostatic lobe between 2007 and 2015. All patients were found to have unilateral disease on the basis on full concordance between multiparametric magnetic resonance imaging (MRI) and MRI-guided biopsies. These patients were matched 1:1 with patients who underwent RALP for PCa in which pT2a-b disease (unilateral) was found on final pathologic analysis. Matching criteria were Gleason score, prostate specific antigen (PSA), and cT stage. Treatment failure was defined as the need for salvage external beam radiotherapy or systemic androgen deprivation therapy (ADT) due to disease progression. Kaplan-Meier curves and log-rank tests were constructed to assess differences in salvage treatment free survival across surgical techniques. Matching was effective with no significant differences across the two groups, although men treated with HIFU were older (p < 0.001). Median follow-up was 36 months (interquartile range 16-56). HIFU was associated to better and faster recovery of continence, with most men (82%) showing no signs of urinary incontinence even right after surgery. Moreover, the risk of de novo erectile dysfunction was significantly lower after HIFU. No significant difference was found in the need for salvage external beam radiation therapy or ADT across the two surgical approaches: 7/55 men underwent salvage therapy in the HIFU vs 6/55 in the RALP group (p = 0.76). Nonetheless, seven more patients in the HIFU arm required a complementary treatment on the contralateral lobe during follow-up, after developing a contralateral PCa. No patient died of PCa on follow-up, while six men died of other causes (five HIFU vs one RALP, p = 0.11). In this matched pair analysis, HIFU hemiablation was comparable to RALP in controlling localized unilateral PCa, with no significant differences in the need for salvage therapies. HIFU was also associated to significantly better functional outcomes. Accurate patient selection remains vital, and larger prospective trials are needed to confirm our findings.